Released hardware by Bally, not including the Bally Professional Arcade console. The Lil' White Ram is a 32K memory expansion unit released in March of 2008. 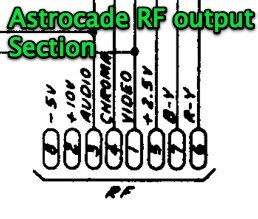 This document includes various pieces of information about the ASTEC UM1291-1 RF modulator, the original modulator used in the Bally Arcade/Astrocade. Included here is the PC board layout, schematic, an excerpt from the LM1889 TV Video Modulator datasheet, and ASTEC's internal product specification. Astrocade Display Kiosk Assembly Instructions - Santa Cruz Wire and Mfg. Co. 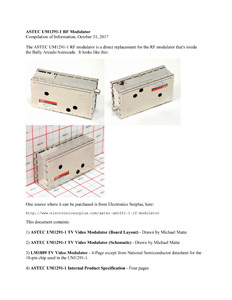 This is the set of instructions used to build an Astrocade point-of-purchase display unit (AKA as Astrocade Store Kiosk) . Also included are scanned pictures of the drawings of the Astrocade kiosk in various stages of assembly. These are four Add-Under blueprints from April 1982. These GIF files are large (24" x 36"). If you have trouble viewing them, then save them locally to your hard drive and don't view them on the Internet. High-Res TIFF versions of these blueprints are available here. "Kludge Board Installation and Modification"
If your Bally Arcade/Astrocade unit has these symptoms: screen tearing, loss of horizontal sync on warm-up, unit goes dead (or keeps resetting after warm-up), the following modifications will correct them. If you unit went completely dead following symptoms these modifications will probably repair it. The ad for this kit reads, "Clock Mod Kit $9.00. Assembled and tested, $11. ppd. Attention!! Experimenters, Serviceman!! Quality, double-side Kludge boards, $4.25 ppd." Ellerson, Barry. "[Bally Arcade 'Kludge Board'] Motherboard Modifications." ARCADIAN 3, no. 7 (May 08, 1981): 72-73. Ellerson, Barry. "[Bally Arcade 'Kludge Board'] Motherboard Modifications [Correction]." ARCADIAN 3, no. 9 (Jul. 09, 1981): 94. (Alternate version of ""Kludge Board Installation and Modification"). 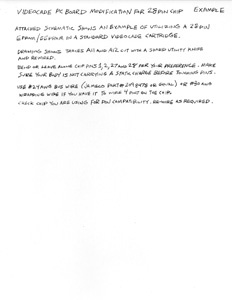 This document is an alternate version of the "Kludge Board Installation and Modification" document. This version doesn't seem to be as detailed as the alternate version, so perhaps this one was written first. 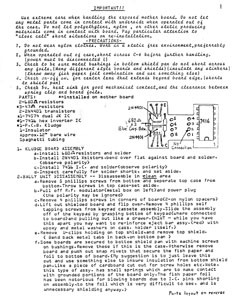 Previously it was thought that these instructions were possibly by Larry Smith. "Bally Hand Control (9-Pin Layout)." 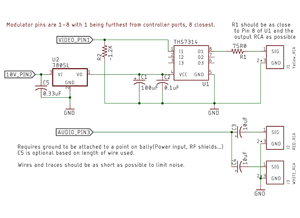 This is a wiring diagram of the Bally hand controller plug. 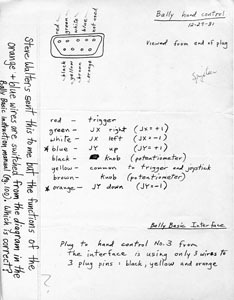 There is a hand-written note by someone (not Steve) that says, "Steve Walters sent this to me but the functions of the orange and blue wires are switched from the diagram in the Bally basic instruction manual (pg. 100). Which is correct?" This guide will allow you to digitally archive Astrocade cartridges using VIPERsoft BASIC, a Lil' WHITE RAM expansion, and an AstroBASIC cart. A sixteen-page manual that explains how to use the Computer Ear voice recognition system. An additional four pages include four BASIC type-in programs: Digital Oscilloscope, Flash Math, Speech 1.8 and Speech 4.2. This is a schematic with notes for a composite-out board designed in 2018/2019. Example comparison pictures are included. How to Modify an Astrocade Cartridge for EPROM/EEPROM Support. Attached is a schematic of a modified videocade (Bally Arcade/Astrocade cartridge) to support/test programmed EPROM/EEPROMs. Michael modified a videocade cartridge and wired it as indicated on the attached schematic back in the 1980s. He may originally have been thinking in terms of EPROMs, but eventually wired a 16-pin header for use with an 9K EEPROM. He also inserted a 32K EEPROM because they're really cheap now. No changes were required. How to Modify an Astrocade Cartridge PC Board for a 28-Pin Chip. Attached schematic shows an example of utilizing a 28-pin EPROM/EEPROM in a standard videocade cartridge. Drawing shows traces cut with a sharp utility knife and rewired. Basic instructions are also included. 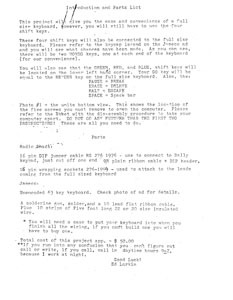 These instructions give directions on how to connect a Jameco unencoded 63-key keyboard to the Bally Arcade. Keyboards such as this were semi-commonly connected via hackers to the Bally Arcade via the Bally 300-baud Tape Interface. This method wires the keyboard directly to the Bally Arcade's 24-key keypad, thus it doesn't require the tape interface at all. These keyboards, from 1979, were often hacked with the 300-BAUD interface to create a keyboard that could be used with Bally BASIC. From the datasheet: "The JE610 ASCII Encoded keyboard kit can be interfaced into most any computer system. The keyboard assembly requires 5V @150mA and -12V @ 10mA for operation. Interface wiring can be made with either a 16-pin DIP jumper plug or an 18-pin (.156 spacing) edge connector." 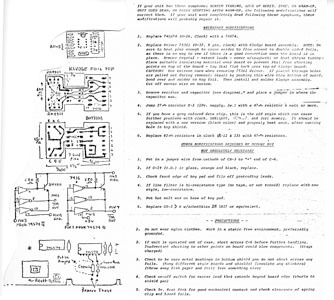 These are plans, including schematics, on how to build a light pen for the Bally / Astrocade. The documentation refers to a tape with a program for this hardware, but that program has been lost or has yet to be archived. Quick directions on hooking up an Atari Light Pen to a Bally / Astrocade. Note about this scan: It isn't the highest quality... but the original source isn't available. Ken Lill notes on Feb. 26, 2010: "It could be used to give you RGB out of an arcade, but you have to wire into the 3 different supplies and the ground. If you DID use this, you shouldn't need the modulator." 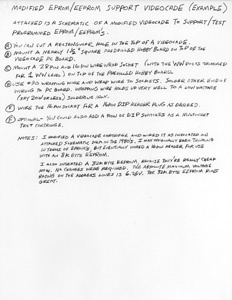 Brett Bilbrey notes on Feb. 26, 2010: "That is the schematic for the Midway RGB board. It was a simple board that converted R-Y, B-Y, Video (where in this case, Video is Luma) to the RGB format. I don't know if you can get your hands on one of the boards anymore, but any R-Y, B-Y, Y to RGB converter should work. The nice part of that would be getting rid of the chroma crawl on the NTSC video and you could use the RGB input on newer TV sets. Two emails about new hardware that would have been available in the 3'rd quarter of 1996 (it never shipped). It was an Add-On Board with Configurable RAM, EPROM or EEPROM, PS/2 Keyboard Interface, Centronics Printer Interface, and two serial ports.